Typically used in the mailing, clothing, stationary, cosmetics, confectionery indistries, etc, our self seal glue strip bags come in an exciting range of options to highlight and draw attention to your brand. High quality printing with “chrystal clear” film will make your product the consumers first choice. 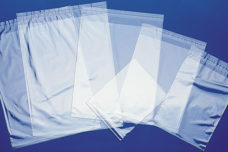 With a choice of Re-sealable, Permanent or specialised ” VOID” tamper evident Glue Tape, the self seal glue strip bags offer pilfer protection to valuable goods inside the bag. We offer specialised “double bags” where combinations of “2 compartments in 1” or unique compartments bags. Metalized Films – High gloss with a “foil” finish the ,eye-catching bags are a classy finish.